Learn about local real estate and housing market trends from The Cascade Team Real Estate. Found 3,026 blog entries about Real Estate News. Saturday, April 20th, 2019 at 4:37pm. Saturday, April 20th, 2019 at 4:28pm. Thursday, April 18th, 2019 at 9:04am. Text: crayondrive to 425-223-4655 for up to date details and drop-off locations! 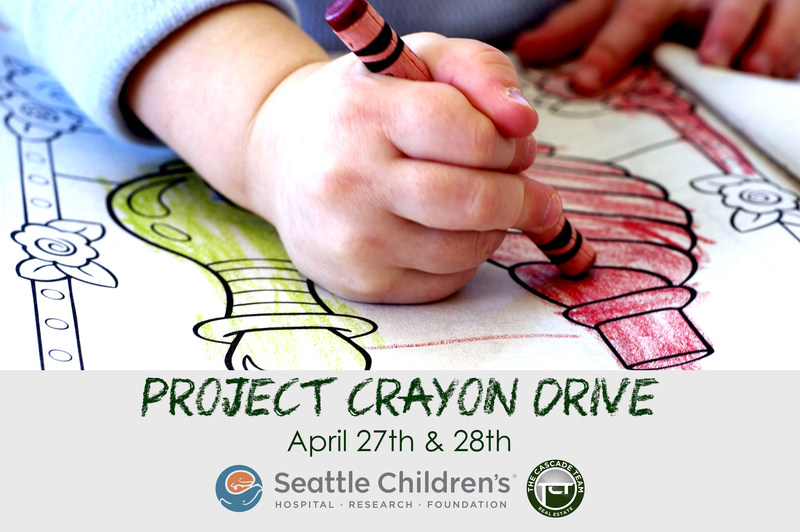 For the 14th year, The Cascade Team is once again hosting Project Crayon Drive this April! For the young who find themselves at Seattle Children’s Hospital, sometimes the simple things like a coloring book and a few crayons can be as soothing as the trained staff and smiling doctors. Yet, something as simple as crayons often goes overlooked. Each year, Children’s Hospital goes through over 240,000 crayons, but each child only gets a couple to use. The Heart of North Bend is excited to announce- The 14th Annual Project Crayon Drive Is Kicking Off! Saturday, April 13th, 2019 at 5:04pm. This is a great cause that is easy to support. If you would like to help, a box of crayons (or more) will do the trick! Please see below for the details, every box helps- I really appreciate your support! Our goal this year is to collect 250,000 Crayons for Children's Hospital! The Cascade Team is once again hosting Project Crayon Drive this month! For the young who find themselves at Seattle Children’s Hospital, sometimes the simple things like a coloring book and a few crayons can be as soothing as the trained staff and smiling doctors. Yet, something as simple as crayons often goes overlooked. Each year, Children’s Hospital goes through over 240,000 crayons, but each child only gets a couple to use. Welcome To The Cascade Team Virginia Carter! Thursday, April 11th, 2019 at 12:22pm. I am well versed with a variety of nationalities and their specific customs and tastes, having worked in the medical and Real Estate industries in Houston. My first career was as a Registered Respiratory Therapist. I worked in the ICU, at The Texas Heart Institute, with post-op heart and transplant patients. The transition to Real Estate almost 20 years ago, was easy. Both involve taking care of people, under potential stressful situations. Welcome To The Cascade Team Susan Berry! Monday, April 8th, 2019 at 9:46am. I decided to enter the world of real estate to join my friends, Paul and Nancy Schulte, in a new adventure - The Cascade Team Indiana! I was a nurse manager (RN) in the hospital setting before staying home to raise my 3 children, Daniel (24), Lizzie (22) and Quentin (17). I bring management experience from my days as a surgical services coordinator and a genuine love of helping people to my new career. My certification in home staging will allow me to flex my creative muscle to help my clients list their homes and is augmented by my 25+ years of home ownership experiences. I am excited for the opportunities ahead! Saturday, April 6th, 2019 at 1:37pm. The 14th Annual Project Crayon Drive Is Kicking Off! Tuesday, April 2nd, 2019 at 11:28am. April is Crayon Drive Month! Welcome To The Cascade Team Hannah Burroughs! Tuesday, April 2nd, 2019 at 8:50am. Paired with a fresh outlook on technology and marketing, the tools by Cascade, and a drive to help people find their potential family homes, I look forward to building and continuing positive relationships with clients and businesses and working for Cascade! Monday, April 1st, 2019 at 2:30pm. If you're ready to jump off that fence - give me call! I would love to assist you in all your real estate needs!